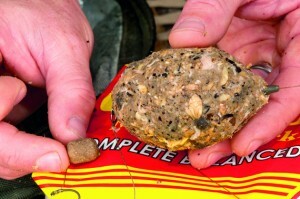 Method feeder mix for carp… on a budget! METHOD FEEDER mixes for attracting and catching carp really don’t need to cost a fortune. Don’t go mad with the size of the ball; make it too big and it will be like trying to cast out a pregnant pig! A well-shaped Method ball the size of a satsuma but more streamlined is about right. Make sure the ball is moulded centrally around the lead so that it casts true, and the line behind the Method ball exits the centre of the bait, or the line will slice through the bait as you cast it and it will fall off – probably onto your head.